Uttarakhand, one of the newly formed states of India is poised for of growth and development. Development of road communication is one of the important needs for faster transport of people and produce. Cutting a road means destabilizing the mountain slopes. The Himalayas as we know are a product of a great collision between the Indian and the Asian plates some 20 million years ago. The mountains that rose are still in the process of rising as the Indian Plate continues to go forward under the Asian Plate. The material on mountain slopes normally lies in a state of balance. The moment there is an upheaval it triggers a chain of events and the slope forming material begins to slide down due to gravity. Similarly all construction activities like road building, housing, schools, hospitals etc destabilize the slopes. Rainwater acts as a lubricant in the event of a landslide triggered during the monsoons. It makes greater volume of mass wasting. The material that slides down kills people in its wake, often blocking the rivers, producing temporary dams. When such dams burst, flash floods cause death and destruction downstream. Through these columns I have often repeated that people are not killed by an earthquake. They either get buried under their own house or are crushed under a landslide in the mountainous regions triggered by the earthquake. Landslides are part of the mountain eco-system. One can not wish them away. But yes a thorough study can delineate areas that are hazardous from the point of view of landslides. Geologists are putting in best of their efforts to identify the causes and slopes in the Himalayas prone to landslides. Recently S.P. Sati, Y.P. Sundriyal and G.S Rawat of H.N. Bahuguna, Garhwal University, Srinagar, Uttarakhand and N. Juyal of Physical research Laboratory (PRL), Ahmedabad carried out an interesting study of some of the perennial slide prone areas. Their studies have highlighted the reasons of slides and mitigation measures. It is worth knowing especially for those involved with the development of such slide prone areas. It is an established fact that the Indian Plate collided with the Asian Plate, resulting in to major tectonic shape up. Due to this collision some deep seated faults like the Main Central Thrust etc developed. These thrust planes are now the weak planes along which the movements are still on. These thrusts are so powerful that they fracture and pulverize the rocks. It is easy for water to seep in through such weakened rocks. Swelled with water these rock masses are prone to slip. Once the process sets in, there is no respite and landslides continue. Role of forestry is important to hold such slopes. Alas we have ourselves hacked forests to make beautiful houses. The dwellings thus constructed are now prone for a sudden burial. Spurt in earthquake occurrences in the past two decades in the Himalayas is yet another factor that increases the frequency and magnitude of landslides. Sati and his co-workers have found Remote Sensing and Geographical Information System (GIS) useful for studying the slope stabilities and also for planning development on more stable slopes. To explain the utility of such studies they have taken four notorious landslides, viz. Malpa, Garbayang, Okhimath and Budhakedar as a case study. Villages have sunk up to 20 m at Garabayang. Sati and his colleagues report from Malpa that the village of the same name located at the confluence of Malpa Gad and Kali River was buried under a landslide due to continuous rains from 13th to 18th August 1998. They ascribe the landslide to pore water pressure increasing due to rains, which lead to movement of the hill side under the gravity. The slide blocked the stream and blocked it. The dam burst and the flash floods washed away whatever came in its wake. The author was serving in the Geological Survey Of India (GSI) those days and a team of two officers V.K. Sharma and R. Sanwal was immediately dispatched to the site of disaster. It is worth recording that the GSI's team was the first one to reach the site and collect information. According to V.K. Sharma the higher reaches of Malpa Gad have crystalline rocks. The open joints in these rocks were filled with water. Night temperatures in the higher reaches drop to freezing levels, especially during rains. Water in the joints and fissures of the rocks there freezes at night. Same melts during the day. Melt water expands and the process generates tremendous force to split open large chunks of rocks. Because of this reason Malpa has an old history of rock fall. The locals were well aware of the problem and that is why the village and habitation was away from the path of the rock fall. However, the Tourist Reception Centre of the government was unfortunately situated in the path of the rock fall. It is also worth mentioning that an Inspection House of the Public Works department constructed during the British regime is situated on a spur across Malpa Gad. The Inspection House escaped the wrath of the falling boulders though its tin roof was damaged by the smaller rocks which came like missiles from top. In this tragedy 220 villagers, their houses and shops perished, due to the flash floods. While Sati and his colleagues have tried to blame the smaller faults present in the area, Sharma says the landslide was mainly due to nature's ire. He has strongly recommended use of precautionary measures especially during the pilgrim rush for Kailash Mansarover pilgrimage. The GSI team had reported that the rock fall had started on the night of 13th August itself and in fact a mule had succumbed to the rock fall. Had precautions been taken, at least the pilgrims camping there on return journey from Kailash could have been saved! Garbayang, the prosperous village on the erstwhile Indo-Tibet trade route is on the brink of extinction, as more than 80% of the inhabitants have already migrated. Those who have remained there are so poor that they can not afford to move out. This is a unique case of mass migration in recent times. People have deserted their villages in Rajasthan due to soil alkalinity forced on their fields by the Indira Gandhi Canal. However, the Garbayang residents have been forced out by the Mother Nature. Garbayang is a sinking village. Scientific reason for which is location of the village over glacial lake sediments. Due to compaction the plinths of the houses sink, causing wide, vertical cracks on the walls. The phenomenon of sinking of the village was first noticed by S.P. Nautiyal of GSI in 1948. In his report he had strongly recommended relocation of the village. Unfortunately it was not implemented. The sinking is unique because it is continuous and Sati and his friends have recorded up to 20m of sinking in a span of ten years. Incidentally Garbayang is just 12 km from the 'dreaded' Malpa. Many times mythologies and folklores corroborate the geological facts. As per the folklore there used to be a huge lake prior to the habitation and thus land was scanty for the settlement. The locals prayed to their local God Namjung to drain the lake. God acceded and broke the barrier at Chiyalekh. This phenomenon has been confirmed by the geologists when they found evidences of bursting of the terminal moraine barrier at Chiyalekh. Okhimath in Madhyamaheshwar valley also faced large scale death and destruction due to heavy landslides. Okhimath has unique terraced fields on the steep hill slope. Through a system of network of drains (locally termed canals) water is taken from the upstream of the river to the highest terrace from where it is allowed to trickle down to lower reaches. Each field has a raised bank on the edge to hold water especially for rice cultivation. And movement of water is controlled. It was August 1998, the rice fields were already full up to the brim plus the unprecedented rain made them full like water filled balloons. On the higher reaches the crystalline rocks are covered by a dense Cedar forest. These rocks have wide open joints and fractures because of the sub-surface movements as they are in the vicinity of the MCT. Freezing and thawing of water in these joints and fissures which are further opened by the roots of the ancient trees is a common phenomenon. Thus on the fateful night the rock mass along with the clay of the rice field decided to slide down. So powerful was the landslide reported V.K. Sharma of GSI that the material not only blocked the stream, part of it damaged the houses on a higher elevation on the opposite side. Bhenti village in Madhyamaheshwar valley was obliterated and Paundhar village on the opposite bank suffered heavy casualties. 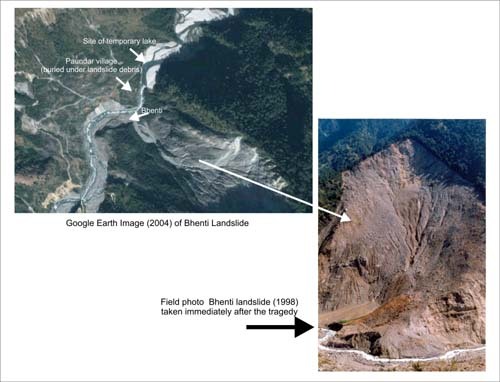 Composite picture of 1998 landslide at Bhenti. Okhimath has been prone to such landslides since ages. But this time it cost 100 lives and property worth crores was destroyed. 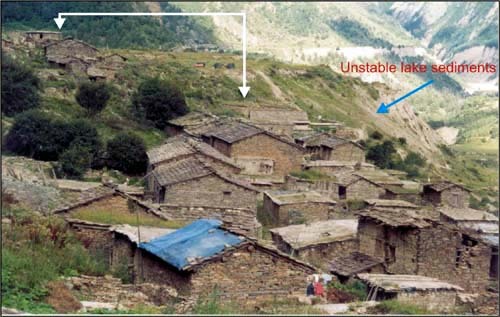 It is common observation that an area so prone to landslides has become densely populated and people have now constructed houses on areas hitherto considered unsafe. Even at the time of investigation of the landslide by the team of GSI in September 1998, a seven storey Hotel had come up at the Bus Stand of Okhimath, located just below the vulnerable steep, fragile slope. Similarly at Kimothi village houses have come close to the seasonal streams. Being located close to the MCT and with a set up which is ready to move down the slope during monsoon, it is indeed hazardous to permit people to live in such areas. It is an open invitation to tragedy. What the local residents and even the administration failed to observe was that the joints of the rocks at Bhenti village had become appreciably wide after the 1991 Uttarkashi earthquake. The widening of joints and fractures is a well established cause of landslides and slope failures. Budhakedar in Bhilangana block of Tehri district witnessed widespread landslides in an area of nearly 250 square km. These affected about 17 villages including Agunda, Medh, Marwari and Kot in Dharam Ganga valley were almost wiped off by a cloud burst 10 August 2002. In general it was a debris slide reported V.K. Sharma from GSI. Twenty-eight people lost their lives in disaster. This area is prone to landslide is the common observation of all the investigating agencies. Majority of the villages affected are located on the stabilized debris of old landslides. The fast flowing river with flanks denuded of vegetation due to anthropogenic intervention makes the river cut its side rapidly. In other words the 'toe' of the hill slopes is eroded. Naturally without toe support the entire mass moves down aided by heavy rains. The GSI team had strongly recommended relocation of villages above the Highest Flood Level. In the event of a landslide the streams often get blocked and when the blockade bursts there is a flash flood. Thus locating habitation on safer ground should be the first move on part of the government. These were just few examples. There are hundreds of water sheds/areas/villages that are helpless against the ire of the nature. Urgent steps are needed to identify such areas and take remedial measures before it is too late.